Mr. Madan Lal RAIGAR assumed charge as the new Consul General of India in Hamburg (Germany) on 11th August 2016. Born in 1967, Mr. Raigar did his schooling at the Government Senior Secondary School, Sri Madhopur (Sikar, Rajasthan, India) and obtained his Bachelor's Degree in Commerce from Commerce College, University of Rajasthan, Jaipur (India). 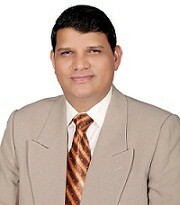 Mr. Raigar joined the Ministry of External Affairs, Government of India in 1989. In addition to working in different capacities at the Ministry's New Delhi headquarters, Mr. Raigar got posted at the Indian Embassies / Consulate Generals / High Commissions in Khartoum (Sudan), Vancouver (Canada), Colombo (Sri Lanka), Abu Dhabi (United Arab Emirates) and Jeddah (Saudi Arabia). Prior to assuming his current assignment, Mr. Raigar was the First Secretary & Head of Chancery in Antananarivo (Madagascar) from February 2013 to July 2016. He is married to Mrs. Vimla Raigar, and has one son and one daughter, aged 24 and 23.